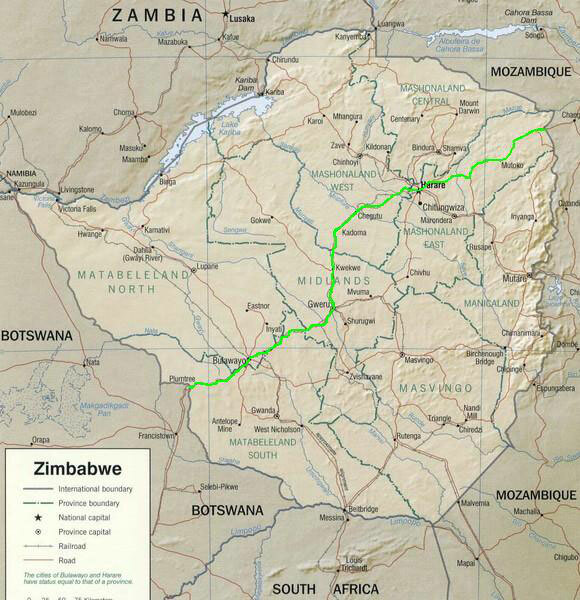 824 km of cycling - as part of a bicycle world trip - from the Mozambique border to the capital Harare, further southwest to Bulawayo and to the border with Botswana. Do you like Cycling Zimbabwe? Days ago we had started trying to figure out the current Zimbabwe dollar's black market rate for not getting totally ripped off at the border. Although changing money outside a bank was illegal in Zimbabwe and once being caught one would be fined and possibly imprisoned, the official exchange rate was about 25 times lower than the rate on the parallel market and so even a warm coke would have become hardly affordable. For security reasons we planned to change money at the Mozambique side of the border and after some negotiating we found ourselves being millionaires: We got 62 million dollars! Unfortunately of course just Zimbabwe dollars with the value of just about 100 US dollar. But in a country where only recently prices in the supermarkets changed thrice a day and where inflation had topped 2,000 percent we didn't know what value would have our money in a couple of days. Zimbabwe rarely saw any tourists these days, so the visa stickers for our passports still had to get fetched out of the safe. But not just at the border we experienced a warm welcome, also in the country apparently the people were happy to see and meet again someone visiting their country. The supermarkets were virtually empty, a couple of soaps were mostly still available. Also the restaurants didn't have nothing, but mostly there could be found at least one restaurant in town with at least one simple meal on offer. Within two days of cycling we reached Zimbabwe's capital Harare, where we took two days off. After almost five months of cycling and travelling together, here Hugo and I seperated. Basically we enjoyed being together, we had had such a lot of fun and in these five months since having met up for cycling the Indian Himalaya we had hared so many unforgettable moments and had had an incredibly great time together. But the travelling pace always had been a kind of a compromise. Hugo had been rather a half-day cyclist while I rather had been a full-day-cyclist. Furthermore since Africa there had been a rough point in the future when I would have to go back home and therefore I couldn't go without at least a rough time planning. So this simply didn't provide the possibility to stay a couple of days everywhere, even if I would have wanted to. I said goodbye to Hugo, we wished each other good luck, while hoping to meet up again one day anywhere, and I got started on my own again. In Zimbabwe's second-largest city Bulawayo I took a day off again and as I already did in Harare, I went again to the local cinema, where recent Hollywood movies were shown for a ridiculously cheap admission of about 0.25 US dollar. Probably for the very last time on this trip I lodged myself in an own hotel room with couches, TV and attached bathroom with a bath, because from Botswana on I would probably have to camp or at the most to stay in a backpacker's dormitory bed. I cycled to the Botswana border and left a country, for that and for its so friendly people I wished so much, that it might get better times as soon as possible.